Gamini Bandara Ilangatilleke -Maskeliya Group Corr. Students protesting near the gate of the college of Education. 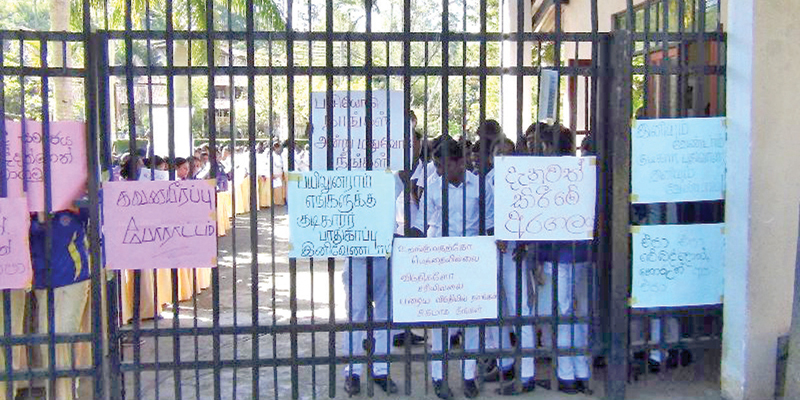 The students of the Sri Pada National College of Education in Patana held a protest demonstration near the entrance of the College for the second day, yesterday. They are demanding the expulsion of a group its employees including the College Registrar, who had allegedly held a liquor party at the college premises on February 5. Commissioner of National College of Education H. M. A. Bandara who is in Colombo, over the telephone, had promised the representatives of the protesters, to provide a decision after conducting an investigation into the alleged incident by yesterday afternoon. The students said they would continue their agitation from today unless the Commissioner took a reasonable decision on the matter yesterday itself. However, the students gave up the protest and entered lecture halls to continue studies after the employees who had alleged to have participated in the party had left the college premises yesterday without reporting to work.